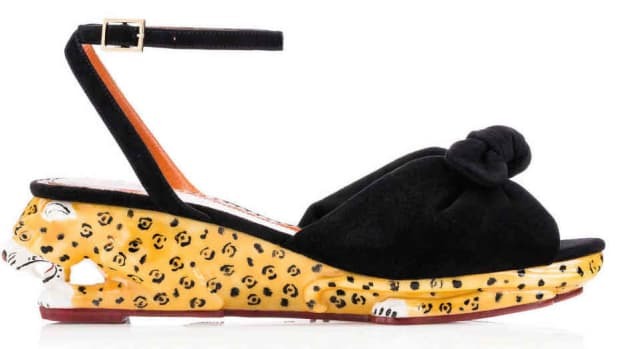 If you were wondering whether many people bought Charlotte Olympia&apos;s famous $600 flats with cat faces on them, the answer is presumably yes, since the label designed by Charlotte Olympia Dellal has today launched an entire kitty flat capsule collection with not one but eight individual cats interpreted through footwear. For instance, there&apos;s Pretty Kitty, you know, that cat that cost a lot and you probably should have adopted but she&apos;s just so beautiful. There&apos;s also Clever Kitty, who wears glasses because cats do that. There&apos;s even Festive Kitty, who&apos;s fancy. Hippy Kitty is super chill, etc. With a few of the cat "personalities" Dellal conceived, we can&apos;t help but wonder if emojis were a point of inspiration (she wouldn&apos;t be the first designer): The winking cat (Cheeky Kitty), squinted kissy cat (Pouty Kitty) and cat with heart eyes (Lovestruck Kitty) are among my most-used characters. With this, Choupette&apos;s new makeup collection and book deal, Barneys&apos; recent cat series and Yohji Yamamoto&apos;s spring 2015 menswear collection, the relationship between cats and fashion is clearly still going strong. The capsule, dubbed Kitty & Co, is available for $595 in all Charlotte Olympia stores and at www.charlotteolympia.com starting Tuesday. Browse the collection below. It was a precarious theme culturally, though it led to some very whimsical shoes and handbags.